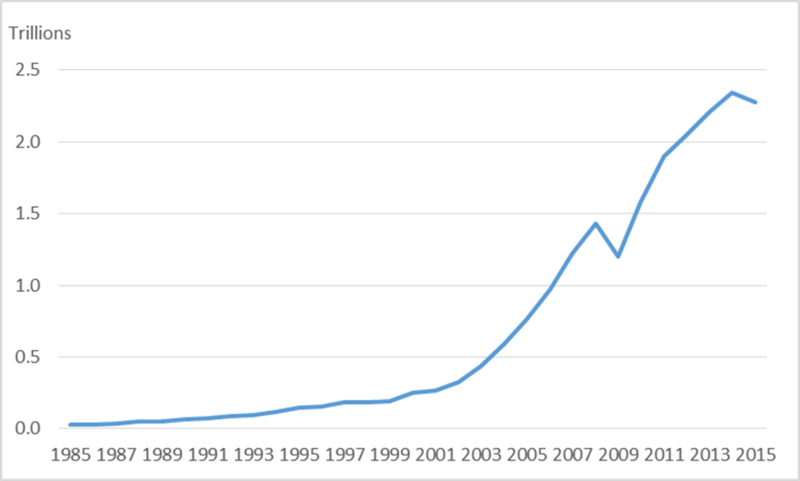 Rising powers have had a profound impact on the WTO. For over half a century the trading system was dominated by the US and other advanced industrialized states, with developing countries and their interests severely marginalized. However, over the course of the Doha Round of trade negotiations, which began in 2001, new powers from the developing world — China, India and Brazil — emerged as major players at the WTO and came to have a significant impact on the negotiations. Contemporary power shifts have helped to democratize and bring greater equality to the WTO. Yet the irony is that greater democratization has caused the core negotiating function of the WTO to breakdown. Acting as leaders of the developing world, Brazil and India emerged as central players early in the Doha Round. They had a significant influence on the negotiating agenda and in shaping the substance and content of the draft Doha agreement. As a result, the prospective deal that emerged was widely considered a relatively good one for developing countries — it contained meaningful reductions in rich country agriculture subsidies and significant gains in market access across the negotiating areas, while its substantial special and differential treatment provisions meant comparatively little liberalization would be required of developing countries. In 2008, the WTO looked close to concluding the Doha Round, with most states generally satisfied with the deal on the table. At that point, however, it was the US that balked — and it did so specifically because of China. Video of Responding to crises conference - Reforming global trade from a world of crisis 1/4 Watch Kristen Hopewell's presentation at the Responding to crises conference. China joined the WTO in 2001, at the start of the Doha Round. The US was an important advocate and driver of China’s accession, based on the expectation that it would make major gains in the Chinese market for its merchandise exports, as well as in areas such as services and intellectual property. The US anticipated that China’s WTO accession would boost US exports and help to ameliorate its trade deficit. 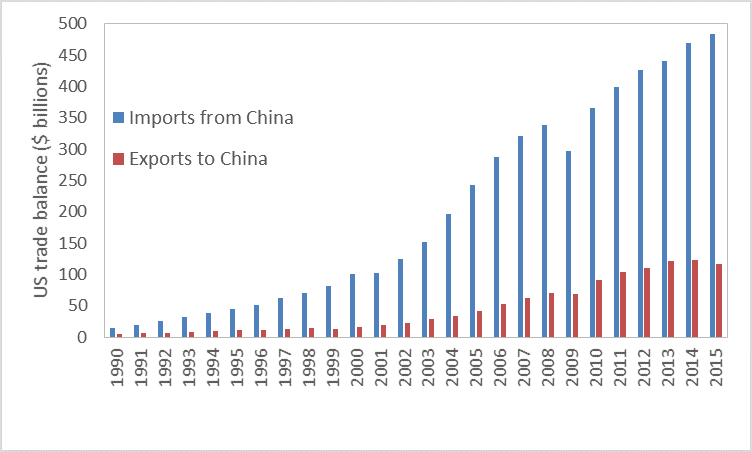 But what in fact happened was that China’s exports exploded following its WTO accession (Figure 1). Concurrently, the US saw a significant decline in its share of global manufacturing (Figure 2). The US was still the world’s largest manufacturer as late as 2000, but over the course of the Doha Round it came to be eclipsed by China. Contrary to what the US expected at the beginning of the Doha Round, its trade deficit with China has grown dramatically since China’s WTO accession (Figure 3). Source: US Bureau of Census. In this context, the draft Doha agreement on the table at the WTO in 2008 had by that point become politically untenable in the US. Under the terms of the proposed agreement, China would be entitled to the substantial special and differential treatment that developing countries — under the leadership of Brazil and India — had been able to secure in the round. The US began to demand additional liberalization from China in manufacturing and agriculture in order to ‘rebalance’ the deal. But China steadfastly refused. From its perspective, this violated the development mandate of the Doha ‘Development’ Round as well as the implicit bargain struck during its accession, where, in exchange for the deep concessions China was forced to make in opening its market, it was promised that relatively little new liberalization would be required of it during the Doha Round. From China’s point of view, the US was now trying to renege on its promises. The result has been a clash between the old and new powers — with the US, backed by other advanced industrialized states, demanding additional liberalization from China and other emerging economies. With the two sides relatively evenly matched, neither has been able to overpower the other. This stalemate caused the collapse of the Doha Round in 2008 and has been the basis of the continued impasse since then. Contemporary power shifts present three key challenges for the multilateral trading system. First, can the trading system adapt to, manage, and accommodate growing economic rivalry between the US and China — the clash of a hegemon and its emerging challenger? This is a key part of the conflict that broke the Doha Round, and persists today as a major impediment to progress in WTO negotiations. A second major and related question is: how should China and the other emerging economies be classified and treated in global trade governance? These countries face significant poverty and development challenges but are also now economic powerhouses and major competitors. Should they be treated as developing countries and therefore entitled to the same special and differential treatment as other developing countries (i.e., granted the same flexibilities and shielded from liberalization)? Or should there be differentiation among developing countries, with emerging economies subject to stricter commitments, closer to those of developed countries? This is a core issue at the heart of the Doha breakdown —the US and other advanced industrialized states have been willing to extend extensive special and differential treatment to much of the developing world, but far less willing to do so for China and other emerging challengers. Finally, is there a fundamental conflict between liberal governance institutions and development? For several decades, under the Washington Consensus, the multilateral economic institutions, such as the WTO, IMF and the World Bank, operated under the principle that economic liberalism — open markets and free trade — offers the best path to development. Within a neoliberal development paradigm, the WTO’s objective of liberalizing trade and the goal of fostering development appear highly compatible. But that faith in free market economics is increasingly being destabilized — by the success of China and other interventionist developmental states, along with the rise of new structural economics and renewed emphasis on the importance of an active state and industrial policy. If there is a growing consensus that development requires significant scope for state intervention, can that be accommodated in, or reconciled with, governance institutions predicated on liberal principles that equate government intervention with protectionism? Kristen Hopewell is Senior Lecturer in International Political Economy at the University of Edinburgh. Her book, Breaking the WTO: How Emerging Powers Disrupted the Neoliberal Project, is published by Stanford University Press. The views expressed in this paper are those of the author(s), and do not necessarily reflect the views of the Institute or the United Nations University, nor the programme/project donors. Blog | Responding to crises: What can we do? What’s next?